How can event processing for microservices be reliably and atomically carried out? Traditional event-driven architectures utilize shared event management programs that can introduce a performance bottleneck and a single point of failure. These potential negative impacts are generally not acceptable to microservices. Performance and reliability are improved by having the event management logic brought inside the microservice deployment boundary and dedicated to the processing of events for that microservice. The event information is registered locally within the microservice’s database and can then be polled by or pushed to the dedicated event management service, which subsequently carries out the notification. A dedicated event management service is deployed within the microservice isolation boundary, thereby guaranteeing that only events related to that microservice will be processed by the event management service. 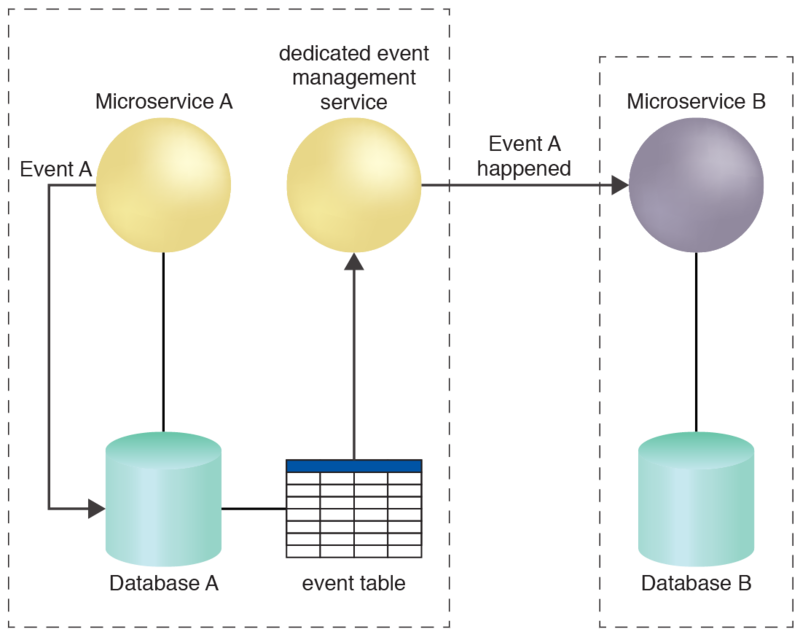 The dedicated event management service reliably notifies Microservice B of the fact that Event A has occurred. This pattern can be applied by utilizing an event store, as explained in the complete pattern description.